This bibliography gets updated periodically. If you notice an article that you think should be included, please use the comment section to bringit to my attention. Abdul-Rahman, O. A., & Hudgins, L. (2006). The diagnostic utility of a genetics evaluation in children with pervasive developmental disorders. Genet Med, 8(1), 50-54. Ariani, F., Mari, F., Pescucci, C., Longo, I., Bruttini, M., Meloni, I., et al. (2004). Real-time quantitative PCR as a routine method for screening large rearrangements in Rett syndrome: Report of one case of MECP2 deletion and one case of MECP2 duplication. Hum Mutat, 24(2), 172-177. Bauters, M., Van Esch, H., Friez, M. J., Boespflug-Tanguy, O., Zenker, M., Vianna-Morgante, A. M., et al. (2008). Nonrecurrent MECP2 duplications mediated by genomic architecture-driven DNA breaks and break-induced replication repair. Genome Res, 18(6), 847-858. Bunyan, D. J., & Robinson, D. O. (2008). Multiple de novo mutations in the MECP2 gene. Genet Test, 12(3), 373-375..
Buoni, S., Zannolli, R., Felice, C. D., Saponari, S., Strambi, M., Dotti, M. T., et al. (2008). Drug-resistant epilepsy and epileptic phenotype-EEG association in MECP2 mutated Rett syndrome. Clin Neurophysiol, 119(11), 2455-2458. Ben-Shachar, S., Chahrour, M., Thaller, C., Shaw, C. A., & H, Y. Z. (2009). Mouse models of MeCP2 disorders share gene expression changes in the cerebellum and hypothalamus. Hum Mol Genet. Carvalho, C. M., Zhang, F., Liu, P., Patel, A., Sahoo, T., Bacino, C. A., et al. (2009). Complex rearrangements in patients with duplications of MECP2 can occur by fork stalling and template switching. Hum Mol Genet, 18(12), 2188-2203. Chao, H-T., .Zoghbi,H.Y., & Rosenmund, C. (2007). MeCP2 controls excitatory synaptic strength by regulating glutamatergic synapse number, Neuron, 56(1), 58-65. Clayton-Smith, J., Walters, S., Hobson, E., Burkitt-Wright, E., Smith, R., Toutain, A., et al. (2009). Xq28 duplication presenting with intestinal and bladder dysfunction and a distinctive facial appearance. Eur J Hum Genet, 17(4), 434-443. Cohen, D., Pichard, N., Tordjman, S., Baumann, C., Burglen, L., Excoffier, E., et al. (2005). Specific genetic disorders and autism: clinical contribution towards their identification. J Autism Dev Disord, 35(1), 103-116. Cox, J. J., Holden, S. T., Dee, S., Burbridge, J. I., & Raymond, F. L. (2003). Identification of a 650 kb duplication at the X chromosome breakpoint in a patient with 46,X,t(X;8)(q28;q12) and non-syndromic mental retardation. J Med Genet, 40(3), 169-174. Djarmati, A., Dobricic, V., Kecmanovic, M., Marsh, P., Jancic-Stefanovic, J., Klein, C., et al. (2007). MECP2 mutations in Serbian Rett syndrome patients. Acta Neurol Scand, 116(6), 413-419. Echenne, B., Roubertie, A., Lugtenberg, D., Kleefstra, T., Hamel, B. C., Van Bokhoven, H., et al. (2009). Neurologic aspects of MECP2 gene duplication in male patients. Pediatr Neurol, 41(3), 187-191.
del Gaudio, D., Fang, P., Scaglia, F., Ward, P. A., Craigen, W. J., Glaze, D. G., et al. (2006). Increased MECP2 gene copy number as the result of genomic duplication in neurodevelopmentally delayed males. Genet Med, 8(12), 784-792. Gu, W., & Lupski, J. R. (2008). CNV and nervous system diseases–what’s new? Cytogenet Genome Res, 123(1-4), 54-64. Honda, S., Satomura, S., Hayashi, S., Imoto, I., Nakagawa, E., Goto, Y., et al. (2011). Concomitant microduplications of MECP2 and ATRX in male patients with severe mental retardation. Journal of Human Genetics, 57(1), 73-77. Kirk, E. P., Malaty-Brevaud, V., Martini, N., Lacoste, C., Levy, N., Maclean, K., et al. (2009). The clinical variability of the MECP2 duplication syndrome: description of two families with duplications excluding L1CAM and FLNA. Clin Genet, 75(3), 301-303. Lee, S. S., Wan, M., & Francke, U. (2001). 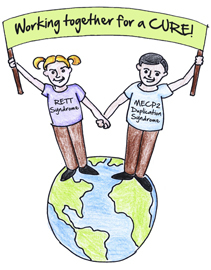 Spectrum of MECP2 mutations in Rett syndrome. Brain Dev, 23 Suppl 1, S138-143. Liu, J., & Francke, U. (2006). Identification of cis-regulatory elements for MECP2 expression. Hum Mol Genet, 15(11), 1769-1782. Lugtenberg, D., de Brouwer, A. P., Kleefstra, T., Oudakker, A. R., Frints, S. G., Schrander-Stumpel, C. T., et al. (2006). Chromosomal copy number changes in patients with non-syndromic X linked mental retardation detected by array CGH. J Med Genet, 43(4), 362-370. Lugtenberg, D., Kleefstra, T., Oudakker, A. R., Nillesen, W. M., Yntema, H. G., Tzschach, A., et al. (2009). Structural variation in Xq28: MECP2 duplications in 1% of patients with unexplained XLMR and in 2% of male patients with severe encephalopathy. Eur J Hum Genet, 17(4), 444-453. Meins, M., Lehmann, J., Gerresheim, F., Herchenbach, J., Hagedorn, M., Hameister, K., et al. (2005). Submicroscopic duplication in Xq28 causes increased expression of the MECP2 gene in a boy with severe mental retardation and features of Rett syndrome.J Med Genet, 42(2), e12. Nielsen, J. B., Henriksen, K. F., Hansen, C., Silahtaroglu, A., Schwartz, M., & Tommerup, N. (2001). MECP2 mutations in Danish patients with Rett syndrome: high frequency of mutations but no consistent correlations with clinical severity or with the X chromosome inactivation pattern. Eur J Hum Genet, 9(3), 178-184. Prescott, T. E., Rodningen, O. K., Bjornstad, A., & Stray-Pedersen, A. (2009). Two brothers with a microduplication including the MECP2 gene: rapid head growth in infancy and resolution of susceptibility to infection. Clin Dysmorphol, 18(2), 78-82. Ramocki, M.B., Peters, S.U., Tavyev, Y.J., Zhang, F., Carvalho, C.M.B., Schaaf, C.P., Richman, R., Fang, P., Glaze, D.G., Lupski, J.R., Zoghbi, H.Y. (in press, Web Preview published). 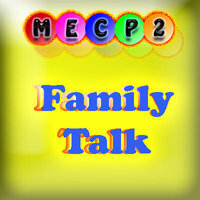 Autism and other neuropsychiatric symptoms are prevalent in individuals with MECP2 duplication syndrome. Annals of Neurology. Ramocki, M.B. & Zoghbi, H.Y. (2008 October 16 ), Failure of neuronal homeostasis results in common neuropsychiatric phenotypes. Nature, 455, 912-918. Samaco, R. C., Fryer, J. D., Ren, J., Fyffe, S., Chao, H. T., Sun, Y., et al. (2008). A partial loss of function allele of methyl-CpG-binding protein 2 predicts a human neurodevelopmental syndrome. Hum Mol Genet, 17(12), 1718-1727. Schluth-Bolard, C., Till, M., Edery, P., & Sanlaville, D. (2008). [New chromosomal syndromes]. Pathol Biol (Paris), 56(6), 380-387. Shi, J., Shibayama, A., Liu, Q., Nguyen, V. Q., Feng, J., Santos, M., et al. (2005). Detection of heterozygous deletions and duplications in the MECP2 gene in Rett syndrome by Robust Dosage PCR (RD-PCR). Hum Mutat, 25(5), 505. Smyk, M., Obersztyn, E., Nowakowska, B., Nawara, M., Cheung, S. W., Mazurczak, T., et al. (2008). Different-sized duplications of Xq28, including MECP2, in three males with mental retardation, absent or delayed speech, and recurrent infections. Am J Med Genet B Neuropsychiatr Genet, 147B(6), 799-806. Van Esch, H., Bauters, M., Ignatius, J., Jansen, M., Raynaud, M., Hollanders, K., et al. (2005). 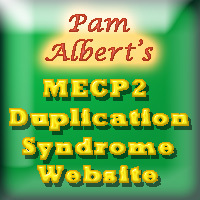 Duplication of the MECP2 region is a frequent cause of severe mental retardation and progressive neurological symptoms in males. Am J Hum Genet, 77(3), 442-453. Velinov, M., Novelli, A., Gu, H., Fenko, M., Dolzhanskaya, N., Bernardini, L., et al. (2009). De-novo 2.15 Mb terminal Xq duplication involving MECP2 but not L1CAM gene in a male patient with mental retardation. Clin Dysmorphol, 18(1), 9-12. [full text available] indicates articles that have free and open access on the web to the whole article (or at least they did at the time that I checked. Most of the links in these articles connect to short descriptions or abstracts. In many cases the full articles can be downloaded for a cost, or may be available for free through libraries that subscribe to that specific journal. Most medical school libraries and many larger hospital libraries may have access. Articles with author’s names listed in green are generally those that address MECP2 syndrome most specifically. The others address it less specifically, but do include relevant information. Please feel free to suggest additional publications using the comments box below. I will add it and a few others. I need to update this bibliography.